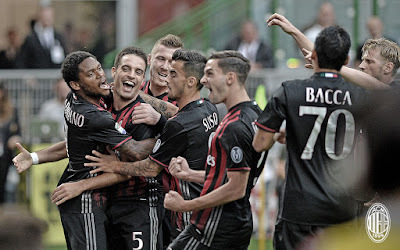 There is a lot of excitement about this Milan win, and a lot of theories as to how the guys pulled it off. 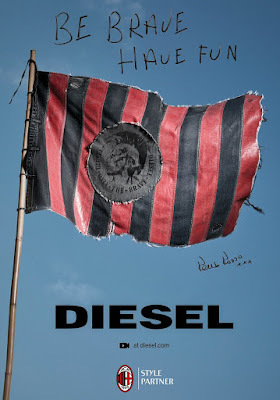 But my theory involves a great new partnership announced this week between Milan and the awesome Diesel clothing company. 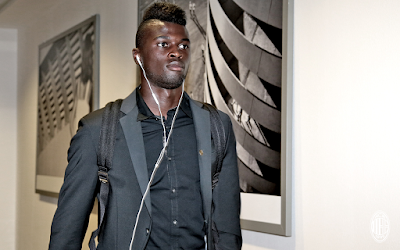 I have previously argued that if a player looks good, he’ll play well, too. And tonight, our players arrived at the San Siro looking amazing. I have made no secret that I have long loved the Diesel brand, whose current slogan is “Be Brave, Have Fun.” And that is exactly what the team did tonight. So I’m gonna give credit for this one to Renzo Rosso & Company. Milan are powered by Diesel. The guys are already taking to the motto of "Be Brave, Have Fun"
However, Sassuolo could claim the match was powered by Guida, or “Giuda”, as they may like to call him. Politano appealed for a couple of penalties in the 32nd. The first was absolutely without merit, the second I cannot say for sure, having only seen one angle. If Donnarumma did in fact push him, then maybe. It looked more like Politano challenged our keeper, who had the ball, at least from my angle, so not a penalty. But the penalty that Milan were given in the 68th was very, very debatable. Niang was sandwiched between two Sassuolo players, physically drew the foul, and Antei was awarded the yellow for Niang’s efforts. I would go so far as to say that Niang has fully assimilated into Italian football, as it was a very “furbo” move on his part. Interestingly enough, VAR (Video Assisted Refereeing) was being tested on this match tonight, but “offline,” not officially. I am pretty sure Di Francesco would have loved to have had it live, as the penalty Niang earned absolutely changed the momentum of the game. From the ugly part of the match to the part that was maybe not so ugly, Milan achieved 53% possession tonight. My very ill-informed commentator used the word “dominated” in reference to Milan, especially in the first half. Had he been here, I would have taken measures to prevent him from continuing to speak, especially with his bastardization of all things Italian as well as his ignorance about most everything, especially refereeing. But he was not here, so I suffered. And Milan did not dominate anything, except passing the ball laterally and back amongst the defenders. Like watching curling, but in slow motion replay for hours. It was painful. But miraculously, out of all of that passing back, Gomez got the wild idea to actually pass it forward, a play which resulted in a Bonaventura goal in the ninth minute. 1-0 Milan. Just over a minute later, the danger of all of that back passing was painfully revealed when Abate made a successful cross and thus assist… to Politano for the Sassuolo goal. 1-1 all. It was written in the stars that one of those horrible passes back would help score an opposition goal (again.) Milan are still suffering from massive defensive blunders, and from conceding almost immediately after scoring. In the 23rd, Adjapong scored a goal that was called off for a handball, and was thus given a yellow instead. Whatever Di Francesco says, that was the right call for that offense. The rest of the half was interesting, as Sassuolo played good football and Milan played their bizarre form of keep away that is becoming all too familiar, randomly attempting opportunities, while Donnarumma cleaned up when the midfield and defense failed to defend. 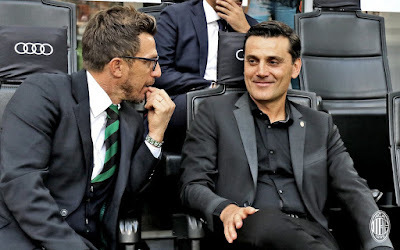 Di Francesco "So, how long are you planning on sitting on the bench tonight?" But it got interesting when Guida inexplicably blew the whistle for the end of the half while Milan were on the counter. Typically, the ref is supposed to wait until a play is complete, but not this time. The Milan players were incensed, and swarmed the ref, as per their status quo. While this is something Montella has said he would not tolerate, apparently he decided that if he couldn’t beat them, he should join them. And so he did. He left his technical area, went out on the pitch, protested vehemently, and was subsequently sent off. I don’t know if the guys were fired up because their coach had been sent off, or what, but they came out playing very differently in the second half. Most likely, it was because Adriano was subbed off for Niang. Adriano had struggled on the wing, and Niang came on like he was Diesel fueled. He seemed to be the catalyst, and the team that had sat back enjoying lazy possession for the first 45 minutes were now attacking. Catalyst. Gamechanger. Powered by Diesel. Interestingly, Montolivo had actually played much better than usual in the first half (yes, you read that right.) But he started meandering around again in the second half, and got a yellow card in the 51st for a dumb late foul. 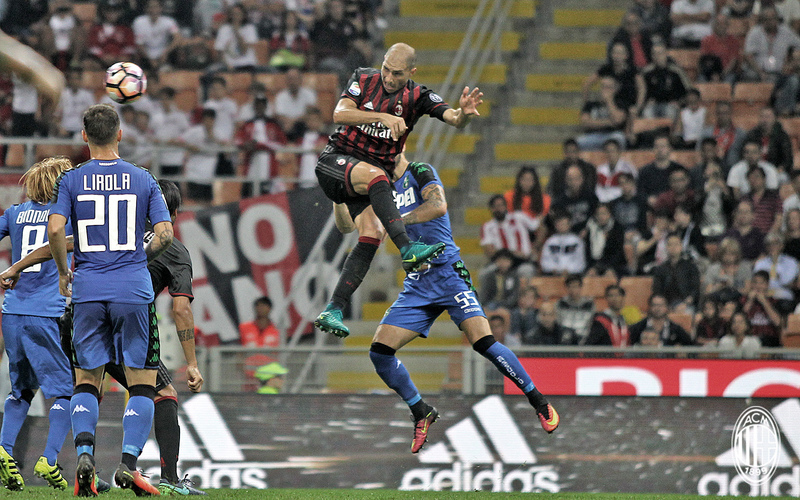 The situation was exacerbated when our former Acerbi, in the 54th remembered the always open gateway between two Milan center backs, which he had once guarded. He took full advantage of Paletta and Gomez’s naptime, and took a brilliant Pellegrini assist and turned it into a goal, 2-1 Sassuolo. Two minutes later, Pellegrini danced around Gomez for yet another goal, 3-1 Sassuolo. It was not looking good at all. But in the 60th, a miracle occurred. Montolivo was subbed off. Yes, he was fiercely whistled by his own fans, more of a vengeance whistling, fueled by years of painful performances by the usurper of the armband than whistling his kinda decent performance on this night. 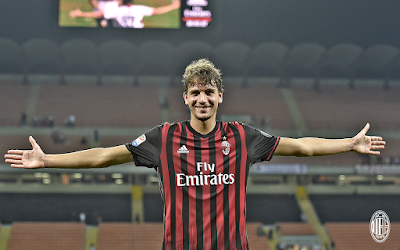 But he left the pitch, and the 18 year old Locatelli replaced him. 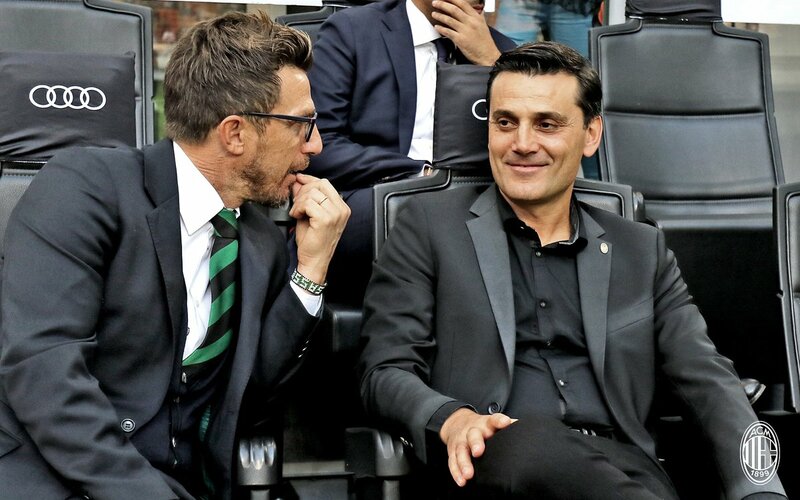 Whether this was Montella’s idea, as he was seen two minutes prior communicating between his glass door, or it was his assistant’s idea, I would love to know. But it was an idea that Milan fans have dreamed of for years, hence the passionately angry sendoff. It was also the catalyst to change the level of grinta on the pitch. Amazing how much changes when all ten outfield players are running. It was eight minutes after that in which Niang earned the penalty by association, and the next minute, Bacca took that penalty and coolly converted it. 3-2. In the 72nd, on a play from a corner, Locatelli scored his debut goal with a rocket from outside the box, then celebrated as emotionally as Pippo Inzaghi. 3-3 all. It was amazing, and the change in energy in our players was physically palpable through the screen. Partially, I think, fans felt it was redemption. After begging, screaming, crying, and even much less proud things to try to get Montolivo benched or even subbed, here he was. And the kid who replaced him showed why he should replace him. Many even named Locatelli man of the match, even though he only played 30 minutes. Because he showed what can happen when you trust in youth and you dare to dream. The last twenty minutes were so intense. The yellows started flowing for Sassuolo as they got frustrated, having given up their lead. In fact, they were also tired from having played in the Europa League on Thursday, and possibly still frustrated by that loss, too. Di Francesco made his subs, but to no avail. And in fact, just five minutes after Locatelli scored, Milan scored again from a play that also started from a corner. Such irony, since we usually concede from corners. This time it was Papa Paletta, whose wife had just given birth this week. 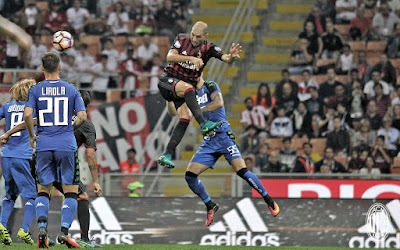 He took a page out of Antonelli’s book from last season, and got up very high and scored a brilliant header to make it 4-3 Milan. Sassuolo were still attacking, all credit to them, something they did for all 90 minutes. But they were also incredibly frustrated, with Biondini freaking out when the ref wouldn’t let him take his free kick quickly because he had to put down the magic spray. Poli came on for Bacca. Whatever, I’m not even touching that one. 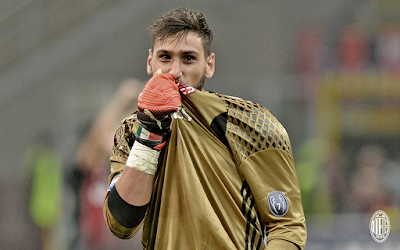 And Donnarumma came up big again to keep us ahead. The ref blew the final whistle, and Milan won, 4-3. It felt like nothing short of a miracle. So it turns out that white men can jump. High. There was such joy and elation following this victory by Milan fans. And how could we not be happy? Sassuolo’s record vs. Milan in Serie A before today was four wins and two losses. They are our Kryptonite. It took them missing a lot of players, especially Berardi, for us to win, but we did it. Okay, there were some questionable calls, and we really didn’t play that well. But on paper, we got three points, and that is what will be remembered. Unfortunately, our discipline issue went all the way to the top, as Montella himself led by example. Will he get a ban for obviously communicating from the stands? Who knows. On the pitch, we still made a lot of the same mistakes and were punished directly for them. In fact, all of Sassuolo’s goals were made by taking advantage of our dumb mistakes. But I think the unspoken victory here was an unlikely changing of the guard. For a “captain” who has entered far more poor performances in his four plus years at Milan than good ones, and off the pitch has angered the fans past the point of angry mobs with pitchforks, his subbing off was nothing short of a miracle. And that Locatelli, at the tender age of 18, came on for him and scored such a spectacular goal at the San Siro, while playing very well, too… miraculous simply doesn’t describe the emotions. There are just no words. Milan got the win, perhaps with a little luck, but also with a lot of grinta. Sassuolo definitely outplayed us, and probably deserved something from the match. Sometimes that happens. Even if Milan didn’t play their best, they did react to being down by two goals and come back for the win. That is massive. It’s impossible to know what would have happened if the correct ref calls had been made (or even what they are, for that matter.) But we witnessed a miracle tonight. Despite so many games of torture, it turns out that Montolivo can be subbed off. Dare we dream that he might not start one day? That is possibly too much. But for now, we will relish this match, the miracle of the sub, and the way the guys fought back for all three points. That’s what happens when you’re powered by Diesel.